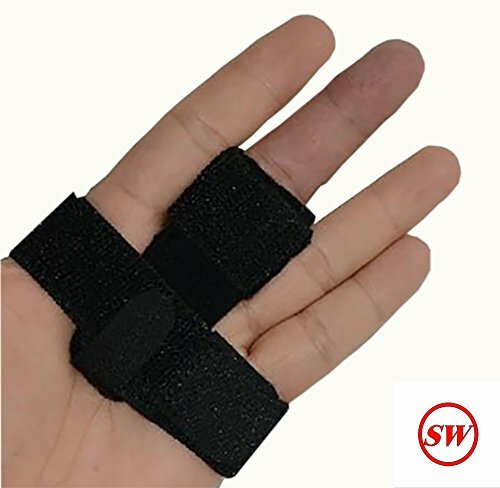 Design provided by SW Trigger finger Splint Brace have next benefits: -SPECIAL DESIGN - of this Trigger Finger Hand Brace Splint is made to fit big variety of different fingers sizes and types. Our product is made of Quality and Comfortable materials which function is to provide you best finger support on yours injured pinky, index, ring, middle or thumb finger. -IMPROVE CIRCULATION - while supporting your trigger finger this hand brace finger splint have also function to help your hurt fingers to heal more effectively by improving blood circulation through injured fingers. Using trigger finger splint can help you relief pain so you can in best cases avoid even surgery. -PROVIDING STABILITY - is another good characteristic of trigger finger splint. While you are cooking, working, playing with kids, playing basketball or doing any different kind of activity this splint role ist to provide you comfort and stability so your injured finger can heal naturally from Stenosing Tenosynovitis. -PAIN RELIEF - is provided by wearing trigger finger splint brace by providing support, stability and circulation flow. You can wear trigger finger splint all day even if you are sleeping, with adjustable brace tape you can fix force of tightening so you feel comfortable. -COMFORTABLE MATERIALS & GUARANTEE MONEY BACK 30 days - Comfortable materials are used for this product which allows your injured fingers to breath naturally, neoprene, covered with stretch nylon and cotton fabric against the skin for the ultimate comfort.There is a full purchase price refund within 30 days of your purchase if you are not happy for any reason. WHEN TO SEE A DOCTOR! Seek immediate medical care if your finger joint is hot and inflamed, as these signs may indicate an infection. If you have any stiffness, catching, numbness or pain in a finger joint, or if you can't straighten or bend a finger, make an appointment with your doctor. SPECIAL DESIGN - of this Trigger Finger Hand Brace Splint is made to fit big variety of different fingers sizes and types. Our product is made of Quality and Comfortable materials which function is to provide you best finger support on yours injured pinky, index, ring, middle or thumb finger. IMPROVE CIRCULATION - while supporting your trigger finger this hand brace finger splint have also function to help your hurt fingers to heal more effectively by improving blood circulation through injured fingers. Using trigger finger splint can help you relief pain so you can in best cases avoid even surgery. PROVIDING STABILITY - is another good characteristic of trigger finger splint. While you are cooking, working, playing with kids, playing basketball or doing any different kind of activity this splint role ist to provide you comfort and stability so your injured finger can heal naturally from Stenosing Tenosynovitis. PAIN RELIEF - is provided by wearing trigger finger splint brace by providing support, stability and circulation flow. You can wear trigger finger splint all day even if you are sleeping, with adjustable brace tape you can fix force of tightening so you feel comfortable. +COMFORTABLE MATERIALS & GUARANTEE MONEY BACK 30 days - Comfortable materials are used for this product which allows your injured fingers to breath naturally, neoprene, covered with stretch nylon and cotton fabric against the skin for the ultimate comfort.There is a full purchase price refund within 30 days of your purchase if you are not happy for any reason. If you have any questions about this product by SW, contact us by completing and submitting the form below. If you are looking for a specif part number, please include it with your message.